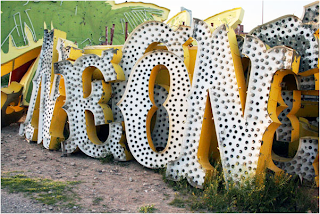 pretty.pretty.paper: wait a minute, a NEON museum? apparently we have a hologram museum in chicago. random. i should go. I've been to Vegas three times and I've yet to get to the neon museum. I've really REALLY want to go though -- it'd be such a fun place to photograph. whoa, that would be the perfect photo op!! I was trying to think of why this seemed familiar and then, yep, I got it: I'm pretty sure the New Kids On The Block filmed one of their videos there. Don't remember which one. Seems like an awesome place, though!